If you are in the market for a high-quality chrome spray kit, you may have heard about Alsa Corp and PChrome as available options for your spray on chrome. Here’s what you need to know about what both companies offer so that you can make a better-informed decision when you are choosing your own spray on chrome system. Located in Los Angeles, Alsa Corp offers a line of silver nitrate spray chrome options along with a line of equipment. Alsa Corp has been in business for two decades and has branches in 70 countries around the world. Alsa Corp offers chrome paint, spray chrome systems and painting equipment that it manufactures in-house. It offers several different types of chrome paint in cans in addition to more robust options that require equipment to apply them. The company offers commercial painting equipment costing thousands of dollars in addition to its paint and systems. Our Dr. Peacock, the founder of Peacock Laboratories, returned to Philadelphia from World War I. He quickly became the nation’s leading expert on silver solutions for mirror making. Over the decades, Peacock Laboratories has continuously manufactured our silver solutions in the original facilities established by Dr. Peacock in 1932. PChrome is a product of our long history of silver chemistry and spray technology. PChrome S and its matching PChrome R are one of many specialized silvering solutions that we have developed to meet the unique needs of our varied customers. The speed and efficiency of PChrome S is a direct result of over 8 decades of silver manufacturing expertise that is unmatched in the industry. The speed of PChrome S gives our customers a competitive edge in their business. PChrome is highly versatile, coming in a variety of size options and color choices. You are not limited by the size of the part that you want to chrome. You can use it on almost any surface type, including metal, glass, wood and more. Highly durable, PChrome provides the brilliance and look that people expect from products that are chrome-plated. 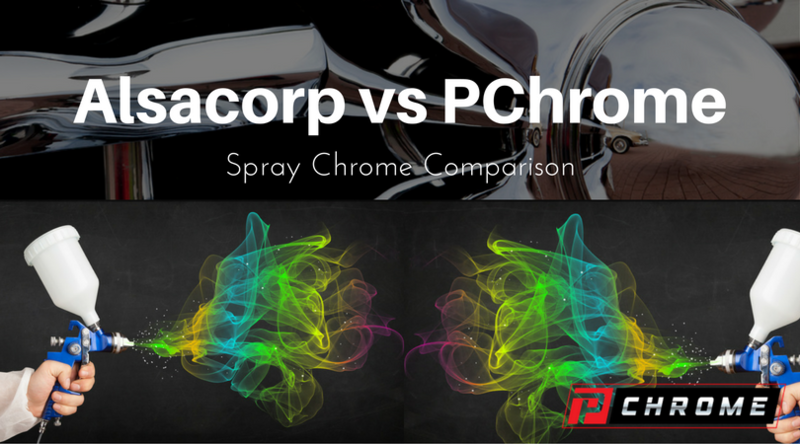 Unlike Alsacorp’s offerings, PChrome does not require you to invest in any expensive equipment in addition to your spray on chrome systems. An excellent choice for users ranging in experience levels from beginners to experts, PChrome offers robust tech support via email, video and phone. The solutions are manufactured in-house, and we provide our customers with everything they need, including our proprietary silvering gun. 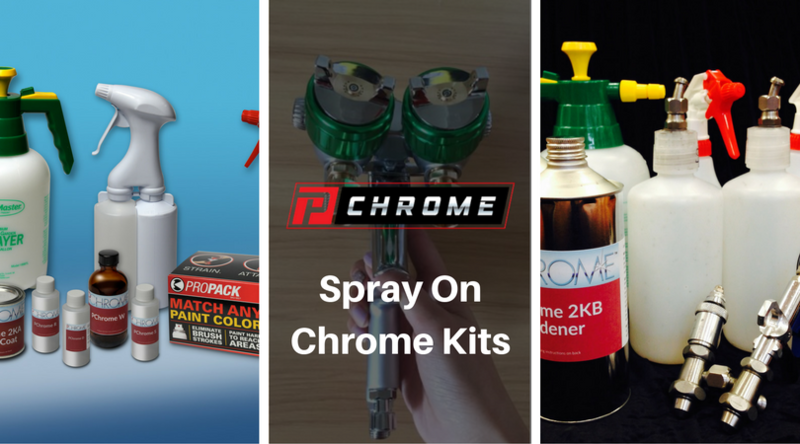 PChrome’s chrome spray systems are also compatible with our competitor’s equipment, meaning that you do not have to go out and purchase new equipment when you already have some in your shop. Tech Support Line is the actual experience and expertize of the support person. PChrome calls are handled by the guys who make the product and have spent years spraying it. Flexible Setup, PChrome does not sell spray tables or confine the user with unnecessary and difficult to maintain equipment. Just the solutions, a dual headed spray gun and PChrome is ready for use in any shop. Adhesion is the capability to survive the industry standard cross hatch tape test. Color Options is the compatibilty with industry standard tints and the availability of predefined colors for the top coat. Product Freshness is the time between manufacture and delivery. PChrome is made every day andvisvuseallybavfew days old when it ships. Many competitors do not manufacture their products so they import from Europe of China. Itvsitsvin theirvwarehouse for months before shipping. Size Options. PChrome manufactures every thing it sells. Orders are filled as they come in. We have small 2-4 oz sizes and multiple gallon sizes to fit the needs ofcsmall and large users. Pricing is based on cost per square foot of coverage. PChrome offers one of the lower but not the lowest cost pervsquare foot.